The other day I was approached by a parent whose daughter had been referred by their Health Visitor to Speech and Language Therapy. This parent came across very anxious as she did not know what to expect, or exactly why her daughter had been referred. It then occurred to me that health professionals i.e. a SLT, Health Visitor, Audiologist, GP etc; need to bear in mind what it must be like for parents coming to our appointments. With this in mind I would like to take the opportunity to let you know what to typically expect from your SLT appointment. However, it must be noted that SLT services vary across the UK, and between independent and NHS services. For instance, we at Small Talk SLT Ltd; prefer to see children in their homes as this is where they are most comfortable and relaxed. A referral may have been made by your Health Visitor, GP or Teacher; or in some instances parents themselves may request a referral through their GP or Health Visitor due to concerns regarding their child’s speech, language and communication. You may have to wait some time for your initial appointment; however if seen by an Independent Therapist children are typically seen very quickly. So what happens at this initial appointment? Case History: typically a SLT will take a thorough case history of your child’s development e.g. when they first sat upright, crawled, walked etc; the ages they were when they first said their first word. They may enquire about any eating or swallowing difficulties, hearing tests or any difficulties encountered during pregnancy or birth etc. All of which provides an SLT with a holistic view of your child’s development. Listen to parents concerns: a SLT will typically allow you time to explain any concerns you may have about your child. Or, explain why your child has received this referral e.g. his teacher is concerned about the production of his speech sounds; ‘k’ and ‘g’. Etc. Assessment: the SLT will then carry out a range of assessments. Some of which may be informal, and can appear as though they are playing games with your child; or they may be more formal e.g. sitting at a table with a book and score sheet. The approach taken all depends on what your concerns are, what the child’s difficulty is, and their age and level of attention. Often, the SLT may need to further observe your child in another setting e.g. school, or home. 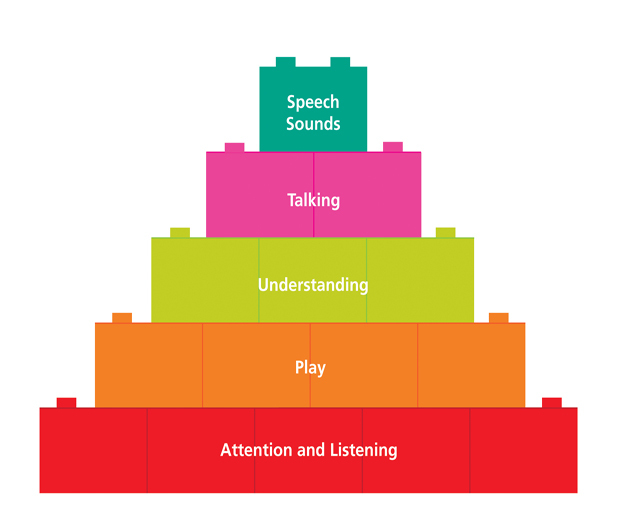 Attention & listening skills are the foundation blocks to your child’s language development. The ability to ‘listen’ and ‘look’ appropriately, and learn to focus their attention will form the basis of all learning. A child’s development of attention is sequential, a SLT will typically use a framework developed by Reynell (1977) to describe a child’s stage of development of attention control. Play is a good indicator of a child’s general development e.g. physically, cognitively and sensory. It also provides an SLT with an indication of what symbolic level the child is at. Play is also an excellent way to assess and build a rapport with a child; then play can be used during therapy especially with under fives. How else would you motivate them? Understanding (receptive language) is the ability to understand what someone communicates, either through sound (auditory), or visually (reading and interpretation of sign). A child’s receptive language skills can be affected by poor attention and listening skills. A child with difficulties in this area may have poor auditory memory, poor concept development, poor vocabulary, poor reasoning skills, difficulties with auditory discrimination, difficulty with interpreting complex grammar communicated by others, poor sequencing skills; and so on. Talking (expressive language) is the ability to formulate a message into words and sentences; which can be spoken, written or signed. A child’s expressive language skills can be affected by their level of understanding e.g. poor vocabulary and concept development can affect how a child expresses what they did at school today. Speech production difficulties, a limited opportunity to communicate, lack of confidence, and motivation can also effect a child’s expressive language. Speech Sounds, the physical production of sounds e.g. p, t k, d etc. are the ‘cherry on the cake’. The child’s ability to produce speech sounds are affected by the previous language levels; and, or physical difficulties e.g. cleft palate. An assessment at each level will determine where a child’s therapy needs to target. For example, a child may be refereed due to poor intelligibility. However, assessment reveals that he has a very poor level of understanding. Therefore this area would be targeted first.